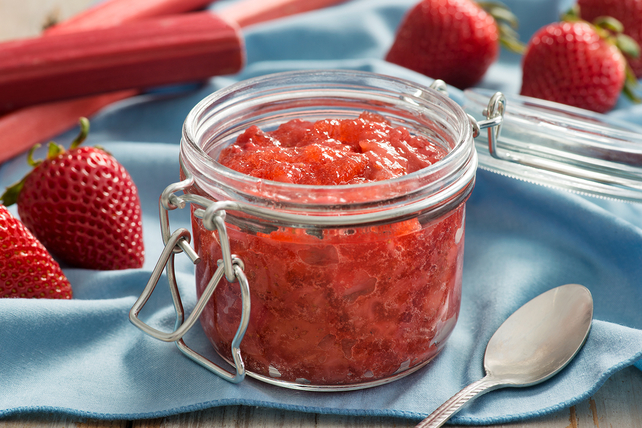 Try our easy three-step method to make our no-cook strawberry-rhubarb jam recipe. A great fruit combination of strawberries and rhubarb results in a flavourful jam. Hull and crush strawberries, one layer at a time. Measure exactly 1-1/4 cups prepared strawberries into large bowl. Finely chop unpeeled rhubarb. Measure exactly 1/2 cup prepared rhubarb into bowl with strawberries. Add sugar; mix well. Let stand 10 min., stirring occasionally. Pour into clean containers, filling up to 1/4 inch from rims. Cover with lids. Let stand at room temperature 24 hours or until set. Refrigerate or freeze until ready to use. No-cook jams can be refrigerated up to 3 weeks, or frozen up to 8 months. Crush strawberries, one layer at a time in bowl with potato masher. Do not process in food processor. To ensure accuracy of the sugar measure when preparing jams or jellies, use a dry measuring cup to measure the sugar, then place all the measured sugar in a separate bowl before adding it to the fruit mixture in bowl.